﻿﻿Earline Shaw is the descendant of TWO Civil War veterans buried in the Table Rock Cemetery, Owen Crisler and John Barrett. She is the proud owner of Barrett's hand carved cane and you can see pictures on his webpage. Her great great aunt Melvina Ward married Albert Hansen, both early Table Rock families. Earline is related to so many Table Rock families that we are giving her a special page as a central gathering point for the interrelated family lines. Here are some of the photographs & other items that she has shared, together with some information gathered from other sources. Earline says that John married Malvina Carrie Harrison. Information posted on Findagrave.com gives the names of their children as Earl Barret (1862-1944), Carrie Barrett Ward (1862-1895), and Arthur Barrett (1867-1928). Carried married William Ward (1859-1931). ​youngest sons ora (1873-1927) and Ira (1876-1951). At right is a detail of an 1887 photograph of Civil War veterans. Owen is obviously the man behind! Owen Crisler, the man in back obvously. 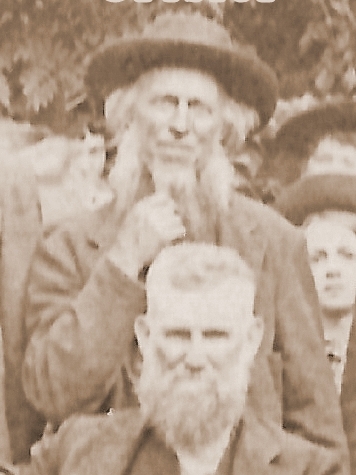 This is a detail from a group picture of Civil War veterans taken in 1887, Photo 558. 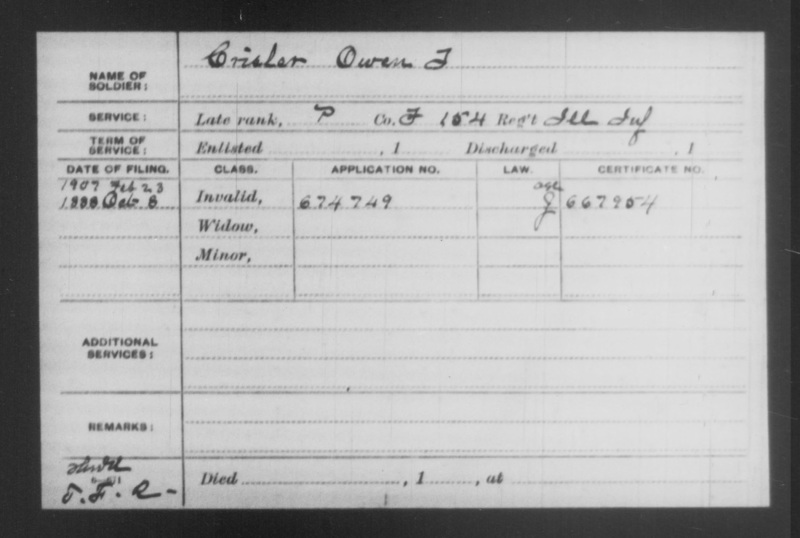 Owen's Civil War pension record. Owen Crisler's land patent for Illinois land. This was posted in Ancestry along with the public family tree of royjgreene." Table Rock Argus, Feb. 11, 1904. Ansylum Silas Crisler was born February 7, 1833, in Boon county, Kentucky, died February 5, 1904, aged 70 years, 11 months and 29 days. The deceased resided in Kentucky until twenty years of age; he then removed to Randolph county, Illinois, at which place, in 1861, he enlisted in Company G, 34th Illinois Infantry, and served his country faithfully as a soldier until discharged at the close of the war. In 1865 he was united in marriage to Mary E. Craven, of Jackson county, Illinois, two children were born of this union, George N. and Clara Belle. George N. now lives at Nemaha City; Clara Belle died in early childhood. In 1871 his first wife died. He was again united in marriage in 1872 to Mrs. Nancy C. Lee, of Jackson county, Illinois, four children were born of this union, Louis Theodore, Oletha C, Amos, and Walter; Oletha C., now Mrs. W. J. Smith, and Amos, both of Table Rock, Nebr., Louis Theodore and Walter both died in infancy. In 1880 death again robbed him of his companion. In 1881 he moved with his children from Illinois to Table Rock, Nebraska, and settled on a farm four miles northwest of town, where he resided until his death. In 1882 he was united in marriage to Clarinda McBride of Jackson county, Illinois, who survives him. 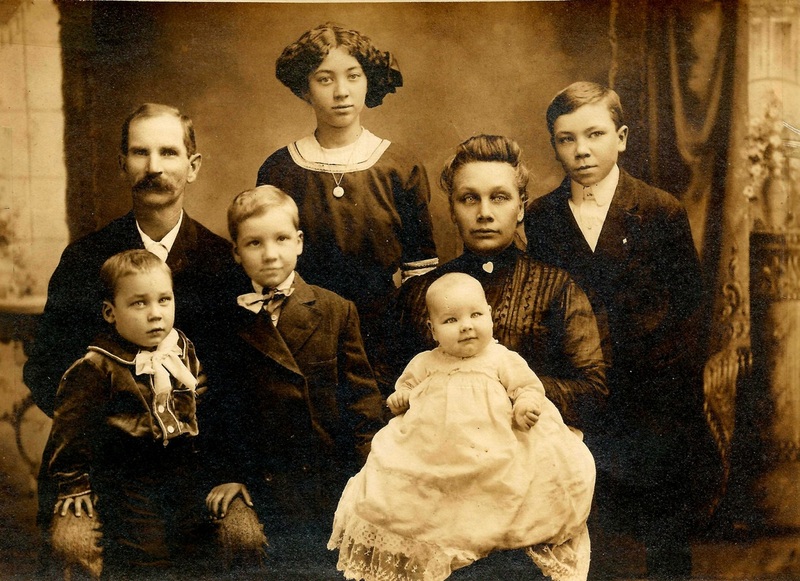 Six children were born to this union, four of whom are still living, two having preceded him to the better land; Raleigh, aged six years, and Sarah E. aged sixteen years; those living are Dora B., Aaron S., Roy, and Martha M., all of Table Rock. 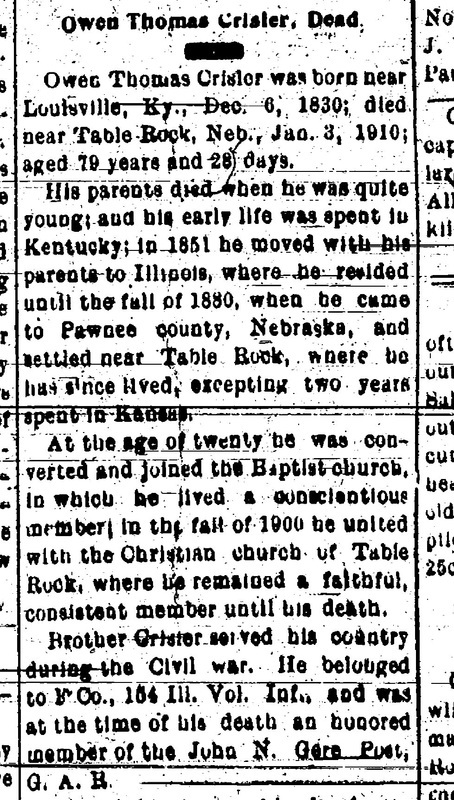 In 1876 the deceased joined the Universalist church and remained a consistent member until January 18, 1894, when he united with the Church of Christ in Table Rock, and has since been a faithful and devoted member. As a Christian he was consistent; as a neighbor, kind; to the needy, charitable; to his friends, faithful; to his family, devoted; to his country, loyal. What higher tribute can be paid to any man? In his death the community loses a worthy and respected citizen, the church a kind brother, his family a loving and indulgent husband and father, but our loss is his gain. The funeral services were held at the home at 3 o'clock on Sunday afternoon, conducted by Elder J. B. Lennon, pastor of the Christian church, and were attended by a large number of mourning friends. Interment in the Table Rock cemetery. 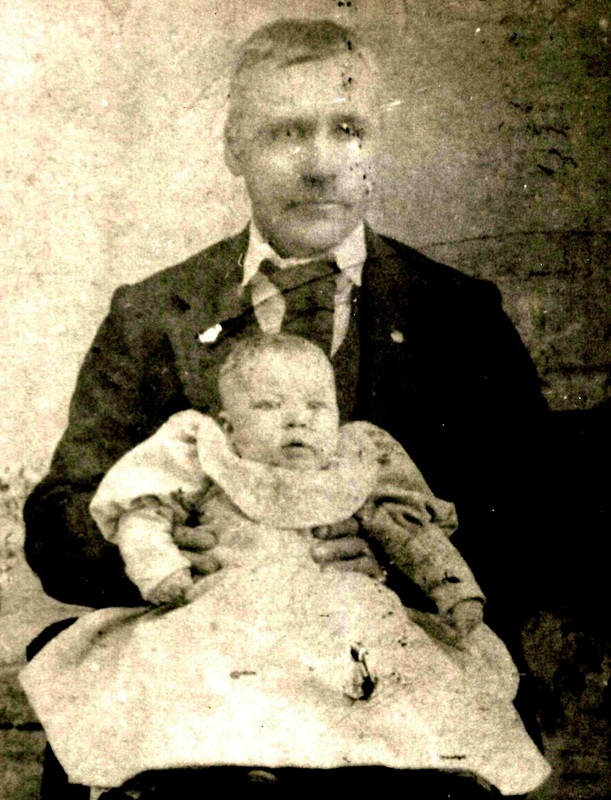 Born in 1873 to William & Lavina Crisler, Etta spent her earliest years in Illinois. After her mother died when she was 7, she & her father came to a farm in Table Rock, along with her grandfather Owen Crisler. Her father's step brothers Ora & Ira, then only 7 and 4, came along, too. That was in September 1880. Etta grew up as an only child; two brothers had died as infants. Her father was remarried, to Manerva Pangburn, but he and Manerva had no children. 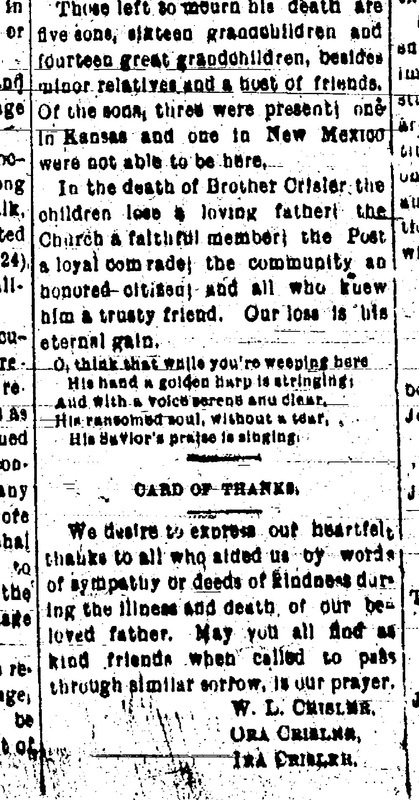 This information is provided by William's obituary. Taken in 1891, Etta Crisler at age 18. She married marry John Tibbets. That is a box that she is holding on her lap; in retouching the photo to bring out her facial features, some detail of the box was lost; it appears to be a package wrapped on the end. Mary Pangburn, William Crisler (seated), Ann Pangburn, Jane Pangburn Crisler, Etta Crisler, Bill Pangburn and Ira Crisler. The picture was taken on the Crisler farm near Table Rock. William Louis Crisler was born in Boone County Kentucky July 14, 1850 to Owen and Lavina (Myers) Crisler. He was the first of three sons. His mother and father moved to Randolph County, Illinois when he was a small child and lived on a farm near Sparta where he grew to manhood. On November 16, 1871 at age 21, William was united in marriage to Margaret Bagley of Ava, Illinois, who only lived nine more years. She died June 30, 1880 in Illinois. They had two sons who died as infants and one daughter Etta, born April 5, 1873. 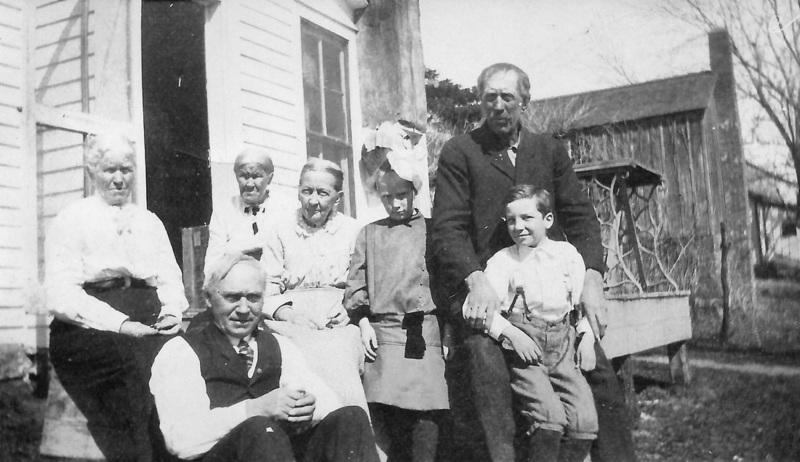 After Margaret died, William with his small daughter Etta, his father Owen Crisler and his two stepbrothers Ora, age 7 and Ira age 4, moved to Table Rock, Nebraska in September of 1880 where they farmed. On March 16, 1884, William was united in marriage with Manerva Pangburn of Table Rock. They had no children. She died at Table Rock Dec 20, 1923. William worked as a school maintenance man for 22 years in the Table Rock schools and was called “Dad” Crisler by many, many school children and friends. He made his home with his daughter Etta for the last 20 years of his life and he died at his granddaughter’s home, Ethel Tibbets Ward in Hoyt Kansas at the age of 95 years, 6 months and 20 days on Feb 4, 1946. He had suffered a massive stroke and passed within several days. 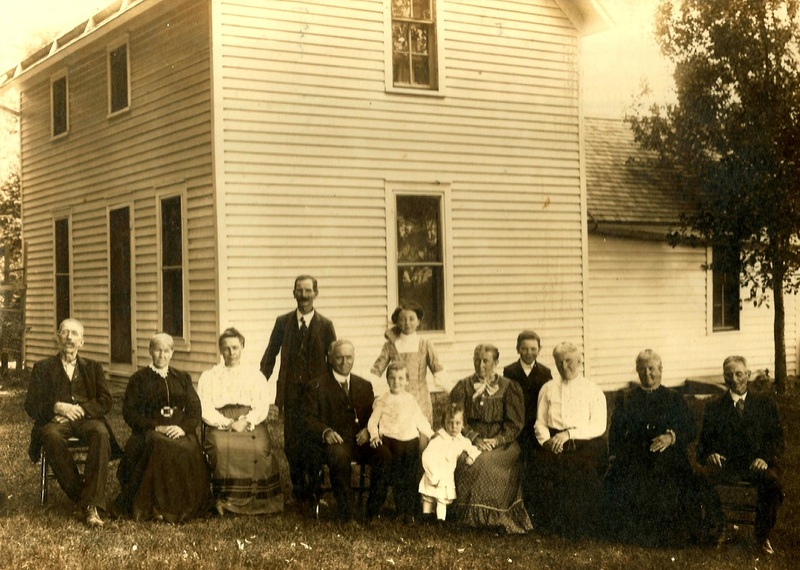 The granddaughter in whose home he died -- Ethel Tibbets Ward -- is the baby on his lap in the picture above. ​ (L-R) Bill and Mary Pangburn, Etta & John Tibbets, William Crisler, George, Ethel and Gene Tibbets, Jane (Pangburn) Crisler, Carl Tibbets, Ann Pangburn, Martha and Oscar Tibbets. Thank you to Earline for sharing this special family tree -- there are so many Table Rock names here!